Northern Pike are very abundant in Lake Simcoe. They are generally caught in the many shallow weedy bays that surround the shorelines. 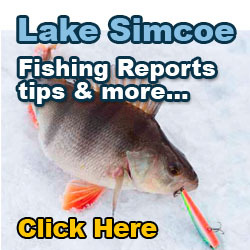 Some of the more popular hotspots for Lake Simcoe Pike, include Cook's Bay, Lake Couchiching, Virginia Beach and around Snake and Thorah Island. The average size of northern pike are generally between 3-5 lbs, although fish in excess of 12 lbs are caught annually. 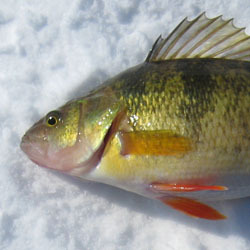 During the ice fishing season, many pike are incidentally caught while fishing for perch, since pike will inhabit the same areas as jumbo perch. 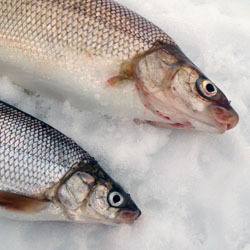 Yellow Perch, Lake Herring and small Whitefish are all considered forage fish for Northern Pike. 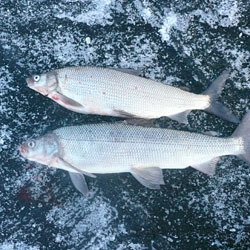 Anglers targeting northern pike during the ice fishing season will generally fish shallow weedbeds, between 10-15 fow. 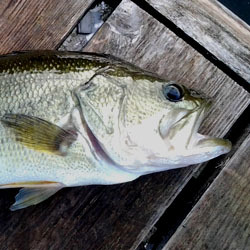 Tip-ups baited with large sucker minnows can be very productive. Many anglers will use a large dead minnow/smelt on a quick strike rig, this rig hangs the dead bait vertically and can produce some large pike, especially in areas with heavy pressure. The stationary dead bait provides a very subtle presentation for finicky pike. 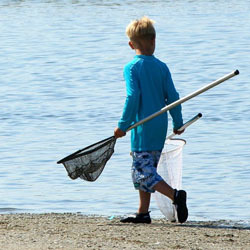 Fishing in shallow water has the added advantage, as to allow visualization of the pike under your hut. 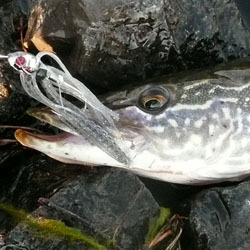 Many times you will see large pike nosing your bait, sometimes gently jigging your bait will entice an aggressive strike. Artificial lures can also produce some nice Lake Simcoe pike especially early in the morning and afternoon, when pike are most active. Lures of choice include large Williams warbler spoons, Rapala jigging raps in shad and perch patterns, and large tube jigs. 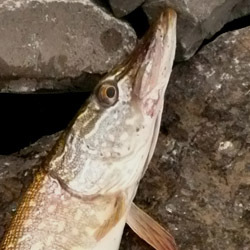 Some of the largest pike are caught in the spring, when pike move into shallow bays to spawn. 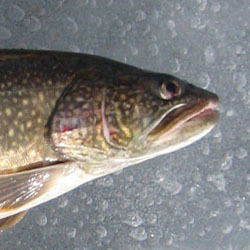 The large weed flats on the north end of Lake Couchiching and the south end of Cook's Bay, especially at the mouth of the Holland River can produce some monster northern pike. 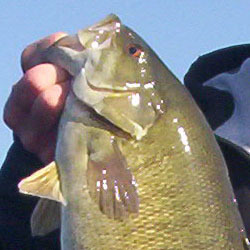 Generally fishing large spinner baits or body baits in these areas can be productive. Fishing large Slug-Go baits can also be deadly especially if the pike are inactive. Many times large pike can be seem basking in the sun in early spring, and a carefully placed lure can entice these fish to strike. Fly fishing for pike with large streamer flies can be exciting this time year, especially when sight fishing for large pike in the shallows. In summer northern pike will move to deeper water 15-20 fow, and trolling deep diving crankbaits in perch, shad or firetiger patterns can produce some fish. Pike will stay in Cook's Bay, but move to deep weedlines. Fish just outside of Keswick, look for the drop-offs at the 10-18 ft. mark, offshore areas along weedlines can be productive. 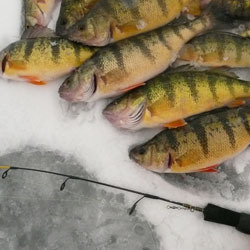 Troll or cast diving crank baits in perch or minnow imitations. If fishing is slow, use a bobber baited with a live sucker.